This post originated from The North American Insulation Manufacturers Association. Roughly three-quarters of builders in U.S. states will soon have to comply with more stringent air tightness requirements of modern version of the IECC (either 2012/15 or 18). As builders seek to meet these requirements, they may be persuaded to believe that multiple and/or expensive products (like spray foam) are the only pathway to achieving the 3ACH 50 target. Testing conducted recently by The New York State Energy Research and Development Authority (NYSERDA) and a top U.S. research lab demonstrates that the 3ACH 50 blower door target can be met using an innovative air isolation management solution, that is not only effective, but less expensive than foam and doesn’t require evacuation of the trades. There are numerous ways to air seal and insulate homes to meet the new air tightness levels demanded by more modern versions of the IECC code. But while there are multiple options and products that can be used, builders may be misguided and settle on a number of unnecessary and expensive methods. Selecting the wrong products can lead to improper use, which in turn can lead to excess spending and result in unintended issues, such as increasing mold and mildew problems or failure to meet higher energy requirements. Avoiding expensive and unnecessary products that can result in air and moisture intrusion into the building envelope is the best. One potential option for builders is to adopt an Air Isolation Management (AIM) strategy that targets air intrusion by simply placing a gasket between sheathing and the framing surface to reduce air entering the insulation cavity. 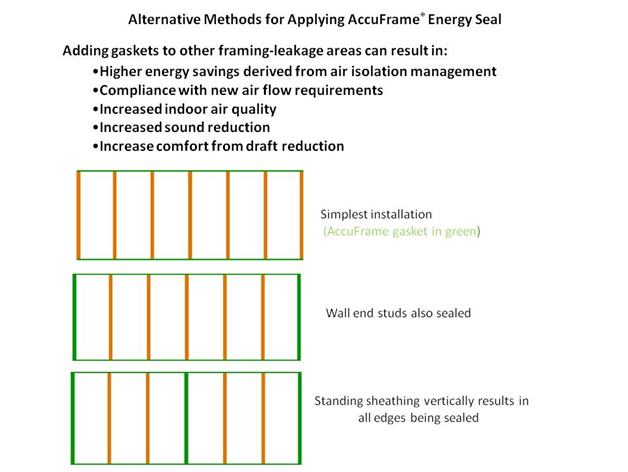 AccuFrame® Energy Seal, a patented product, consists of a gasket material with a framing template printed on it. The template serves as a guide to speed the framing process by eliminating common framing errors, and is itself incorporated into the structure, reducing air flow and serving as a thermal break. (see product video). While the AIM approach is continuous air isolation, it remains “vapor open” with regard to permeability issues, unlike other air and vapor barriers that require careful planning to avoid trapping moisture in the wall cavity. Gaskets are sandwiched between building components and pinned in place making them more durable than caulks or specialty tapes that fail when their required surface bonding breaks down. Framing errors are reduced and the framing process simplified by using the gasket template. The gasket is unaffected by after construction movement because it’s embedded between the frame components. UV light degradation is not a factor because gaskets are in areas that aren’t exposed to sunlight. The low thermal conductivity of the gasket reduces thermal bridging between sheathing and frame by approximately 25 percent in an average-size home. Gaskets increase wall cavity temperature reducing mold/mildew propagation by limiting moisture-laden exterior air entry into the insulation cavity (see my other blog concerning air entry). A better thermal envelope in general, results in better indoor air quality, less noise, improved owner comfort and lower owner energy costs. The system has been vetted by the New York State Energy Research and Development Authority (NYSERDA) and a top U.S. research lab. An ASTM E2831 protocol showed a reduction of air intrusion of 81 percent in a conventional wall configuration (wall testing details). Because of this high reduction in air flow, low cost, and the adaptability of the product to most framed construction, NYSERDA is assisting in the commercialization to advance the method nationwide and has assigned an Entrepreneur In Residence to work with AccuFrame. To test the effectiveness of the gasket system, whole house testing was conducted with and without gasketing using typical onsite construction methods that would be expected at a modern building site. Habitat for Humanity built two identical homes, side-by-side in upstate New York, one with gasketing and one without. The Gasketed Home was built using the gasket framing template as directed, in walls with no other air sealing methods. A medium strength gasketing layout was used where the top and bottom plates and wall end studs were sealed (layout 2, below) to provide even greater airflow reduction than in the NYSERDA wall testing (above) that used the simplest installation (layout 1). The Benchmark Home underwent an aggressive, meticulously installed silicone-caulking application to framing areas not generally sealed to learn how gasketing would perform against other stringent interior sealing methods. In both homes the sheathing and weather resistant barrier were taped. Both houses had 2 x 6 24-inch on-center stud spacing. Both houses used fiberglass batt insulation. Third-party blower door testing at 50 pascals, was conducted on both homes consecutively by certified HERS rater Newport Ventures in February. In this particular study, framing gaskets made the difference between passing and failing the new energy mandate of 3 ACH 50. The gasketed home showed an impressive 30.4 percent decrease in air intrusion over the benchmark study home. Because gasketing is so economical and blends easily into the building workflow a contemporary home can incorporate the system while using lower cost fiberglass batt insulation to meet the code requirements. This alone can save builders thousands of dollars when switching from spray foam alternatives, and also eliminates the hassle from scheduling separate contractors that require all tradesmen to vacate the project for days reducing the builder’s productivity and turnover time. These savings, and the savings realized from the simplification of the framing process itself by using a gasket system as a pre-printed framing template in the initial construction steps, together make this type of solution a valuable, low-cost answer to two pressing problems of modern home builders. Hey! This post has no comments! Be the first to leave one! Michael Schettine, who writes the majority of the articles on this site, has more than forty years’ experience in home building, carpentry, and architectural restoration. He is currently president of Schettine Associates Inc., which markets his patented AccuFrame® Energy Seal, a construction-integrated gasket solution for Air Isolation Management-”AIM for Performance”.